The story of Sultan Tengah ends abruptly. Throughout his life, Sultan Tengah was a tireless Caller to Islam and was a guest in the royal courts of three kingdoms. Returning from an odyssey of 40 years, he was assassinated by one of his own followers within the shadow of the solitary mountain that marked his domain. What clues to his murder can we find in the legend of Sultan Tengah? Sultan Tengah was clearly a difficult man. Born third in line to the throne, he saw himself as the natural successor. Through his own charisma, force of character or the strength of his reasoning (see the Legend), he was enough of a threat that he could not be ignored or dismissed. Instead he was placated with a throne of his own, the faraway Land of Sarawak, and thereby eased out of the picture. Sultan Tengah had high aspirations. After only a short time in Sarawak, he set off across the ocean to the Land of Johor-Pahang. Perhaps he was unsatisfied with his new kingdom, which lacked the grandeur of Brunei or other courts. It seems more likely he was looking for a suitable bride that would enhance his position as a newly minted Sultan. In the royal court of his aunt and uncle he caused offence and was forced to leave. Maybe he lost his temper as the dance story suggests. Maybe he found the offer of marriage to Princess Cik Zohra unacceptable. If the purpose of the voyage was to enter into a suitable union, it is possible that the dispute was over his status: whether he was a Sultan equal to his uncle Sultan Abdul Ghafur Muhyiddin Shah or merely a prince subordinate to Sultan Abdul Ghafur and the Sultan of Brunei. Sultan Tengah was a constant rival. He was welcomed in Sukadana by the newly converted Raja Giri Mustika. His legitimacy as an Islamic sultan with purported ancestry from the Prophet’s bloodline may have imbued him with prestige that Raja Giri Mustika, now Sultan Muhammad Saifuddin, desired. By arranging a marriage with their children, Sultan Muhammad Saifuddin would have gained status for his line. But it was not useful to have Sultan Tengah around, where he might overshadow Sultan Muhammad Saifuddin. So, when Sultan Tengah asked to go into the countryside to call people to Islam, Sultan Muhammad Saifuddin suggested he do it far, far away, in the upper northwest corner of the island. Once again Sultan Tengah had been outmanuevered and eased out of position. In Sambas, Sultan Tengah was again able to use his prestige as an established Islamic monarch among the old Hindu royal houses. The monarchs along the west coast of Borneo would have been remnants of the disintegrated Majapahit civilization, backwaters in a new age when the Message of Islam was spreading rapidly in all the important port kingdoms of the Nusantara. The monarch of Sambas allowed him to preach in his realm, and perhaps when enough of Ratu Sepudak’s people were receptive to Islam, Ratu Sepudak’s daughter converted and married the son of Sultan Tengah. Nonetheless, Sultan Tengah appears again as an overambitious man: he felt Ratu Sepudak left the throne for him. Only local opposition eased him out of the realm for a third time. Sultan Tengah could not have been too eager to return home. 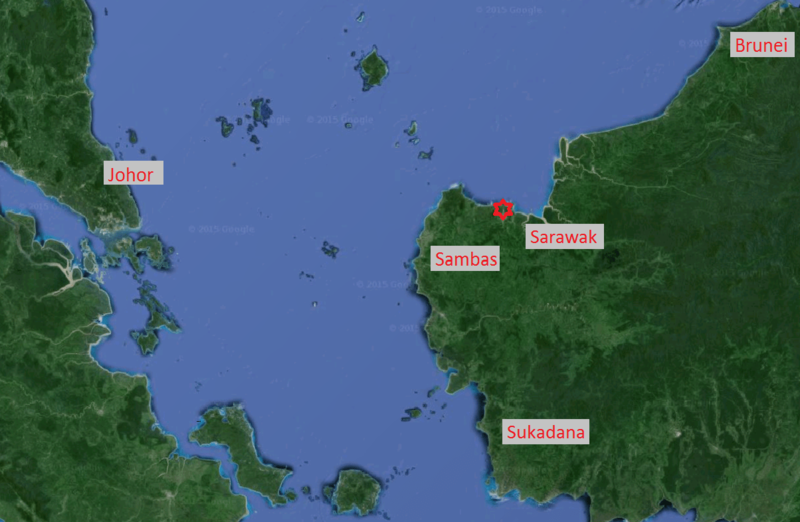 Despite the proximity to Sarawak, he lingered in Sambas for 30 years. Maybe he looked down on Sarawak. His tireless efforts to win a better kingdom point to that. Maybe he had some premonitions. In either case, he was stabbed to death upon setting foot at Crocodile Rock. We will never know who wielded the knife that struck Sultan Tengah down, but the story points to several reasons why. Maybe he was headstrong and short-tempered. A man who strikes his dance partner over a handkerchief may also be a man who is hard on people under his rule. More likely he was a threat to other monarchs for his restless ambition. By the time he sailed for Santubong, Sultan Tengah appears to have been persona non grata in no less than four kingdoms. Any of the four may have been satisfied with his demise. One court had the most to gain: with his passing, Sarawak shortly reverted back to the control of the Kingdom of Brunei. And Allah knows best. The idle speculation presented above is not to dishonor or cast aspersion on any man living or dead, least of all Sultan Tengah, who appears to be responsible for the Islamization of large swaths of Borneo, and may Allah reward him for that. Yet men are men, history is whose-story, and when only fragments reach down to us it is only right that we examine those fragments as closely as possible to learn what we can.